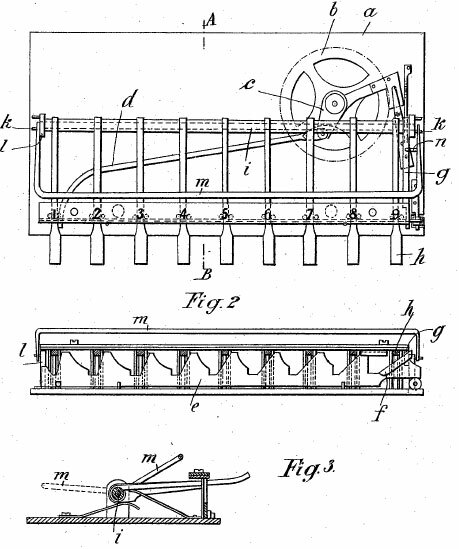 The first patent of the Adix adder is the German patent №DE173286 from 11.12.1904 (see the lower drawing), granted to the famous Austrian engineer, equipment manufacturer and inventor Josef Pallweber from Salzburg, known mainly as the inventor of the so called jump hour watch (first digital watch). Starting from 1883, Pallweber was a holder of many patents in several countries for clock devices and 3 calculating machines. The device was in production from 1904 till 1930 by the Adix Company, Mannheim, Germany (owners Josef Pallweber and Adolf Bordt). Improved versions of the device were manufactured also under other names, e.g. Diera (since 1911) and Kuli (since 1913). 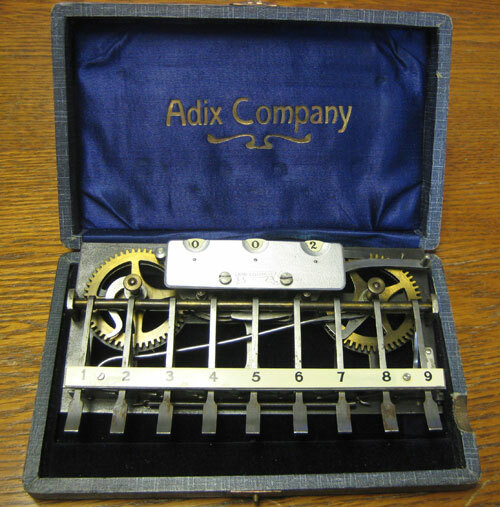 The Adix is a click wheel column adder with nine keys, overall dimensions 15 x 10 x 3 cm and weight 0.5 kg. It was sold in a grained leather brown wooden box. The whole mechanism lies exposed so that the operator may clearly see the manner in which the key depression is transmitted to the counting mechanism. Addition occurs by key depression, but the machine does not permit addition of whole amounts, it merely permits additions of columns of individual digits to the extent to which they do not exceed a total sum of 999. If calculation in one column has been completed, the operator makes a note of the last digit and registers the carryover by means of the keys. The company's name is written in Gothic script and bears the word Mannheim. The calculator consists of 122 parts and for the first time in a computing machine uses parts made of aluminum. From the patents it appears that its key selling point was that it was noiseless. Who was the engineer and inventor Josef Pallweber? Josef Benedikt Pallweber was born on 7 February, 1858, in Schörfling am Attersee bei Vöcklabruck, a market town in Upper Austria. Until 1886 Pallweber worked as a watchmaker in Salzburg. In 1886 he moved to Mannheim, Germany. There on 16 August, 1886, he married to Lina (Magdalena) Mack. Around 1890 he moved to Furtwangen. From the middle of the 1890s until approx. 1902 Pallweber worked at the Frankfurter Fabrik Mechanischer Apparate in Frankfurt. There he worked among other things on the construction of a "clock with convertible digits", a cash register and a printing full-keyboard adding machine. 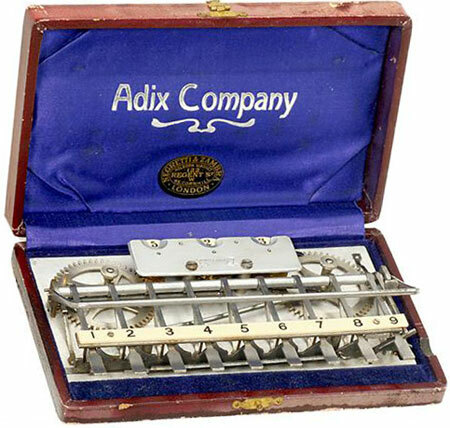 On 1 October, 1903, the company Adix Company Pallweber & Bordt of Mannheim, Germany, was entered into the commercial register, for production of calculating machines. The sole shareholders were Pallweber and Bordt. On October 1, 1908, Pallweber left the company, and Bordt became sole proprietor. After leaving the Adix Company in 1908, Pallweber established a company for technical inventions and patente an "alarm device for portable cassettes and similar containers". By 1911, the patents shift focus to alarmed portable cash boxes, and we can only assume that he succeeded in making a living from those as well. Josef Pallweber died on 28 January, 1921, in Mannheim, shortly before his 63-rd birthday.